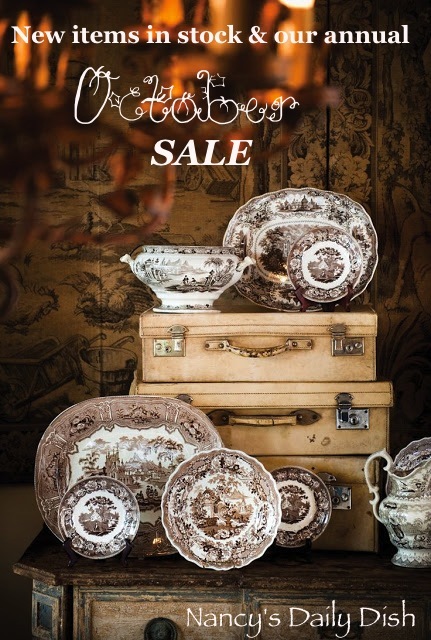 The October sale is on! "I am glad I live in a world where there are Octobers"! and get 20% off your entire order. Sale ends 10/22 so HURRY! Not applicable to prior purchases. I love hearing from my readers. I appreciate the time you take to post a comment and I read them all. I am sorry for not posting more pictures of the progress we've made settling into this new (to us) home. It seems life rushes by so fast and that at times, doing little things, even those that I love and enjoy, often get pushed aside and onto the back shelf of my mind where I tell myself, "I'll get to this later". Well, it is later and though I don't have as much to share with you as I'd like, I'm going to at least share my favorite spot in our living room. I promise to show the rest of the room soon but for now the opposite half of the living room has been occupied by my daughters boyfriend who has been staying with us for the past 7 or so weeks until his apartment is ready for him to move into, and so the couch is usually made up for him to sleep on! A couple of weeks ago I shared some pictures of beautiful rooms in red and blue color schemes decorated with transferware. Here is another roundup of rooms that I adore, all with red and blue color schemes and all with transferware! Last week, Shawn and I popped into a couple of estate sales and I picked up over 100 pieces of Johnson Brother's The Friendly Village. I think I may have to hang on to 12 of the dinner plates and use them this year at Thanksgiving but the rest of them, including this 48 piece service for 8, will be you know where. I don't know about you all, but I have had enough of Summer and I am down right ready for the cooler temperatures of Autumn. I've been doing a lot of rearranging around the house….I'm in one of those zones where I've got a zillion projects going on, even if half of them are just in my mind that I'm contemplating! We've also been moving kids out and around. Three of them are out and the three still at home are moving or rearranging their rooms around. Since I am yearning for Fall, haven't posted any tablescapes in a while and just got these Friendly Village pieces I decided to set the table with them. Brown was introduced as a transferware color around 1829-30 and is the least expensive of colors to make. Therefore it is fairly common, so far as transferware goes, to find. It is also one of the most collected colors and it is probably the most versatile of colors in my opinion. Brown is neutral and looks good with any color scheme from pastels to rich jewel tones, but it is with the ushering in of Autumn that I see it popping up in home decor and vignettes the most. Though, most of these rooms and vignettes are decorated with brown pieces year round, it just seems the perfect time to share them. I may have to do another post because there are so, so many more equally beautiful spaces that have incorporated the use of displaying brown transferware and I can't fit them all here. So, check these lovelies out and then stick around for the giveaway at the bottom of the post. What is the Aesthetic Movement? The Aesthetic Movement refers to a period of time in the late 19th century (1870-1900) which was a backlash to the formal Victorian years. Artists and writers of the Aesthetic movement period maintained the belief that art should provide refined sensuous pleasure, rather than convey moral or sentimental messages. They believed that art did not have any didactic purpose; it need only be beautiful. Japanese art had a great influence on Aestheticism. Aesthetic interiors were often decorated with Japanese prints, screens, fans and other objects. An appreciation of the art of Japan is seen in the work of many Aesthetic artists and designers such as James McNeill Whistler and E.W. Godwin. Decorating with Blue Transferware and a GIVEAWAY! If you haven't already been over to Enchanted Home, you'll want to go over after you finish this post because the wonderful Tina, who authors the incredibly gorgeous blog, has a great post up about decorating with dishes plus she's hosting a giveaway to my online shop, English Transferware! Details at the end of the post! I know Tina loves blue and white (just look at her header and you'll know!) and has a collection of her own. In honor of Tina, I've decided to share some of my favorite images of rooms decorated with and often around blue transferware collections. You can see more rooms decorated with blue transferware on my Pinterest board. To me, Charles Faudree is just about as synonymous with English transferware as he his with French Country Decorating...he seemed to always find a use for it in his incredibly detailed decorating schemes. Isn't this bedroom charming? Have you ever known a child to resist a bunny rabbit? They're so adorable. It seems that at some time we've all had as our own, or known someone who had, or bought for our children, a pet rabbit. I remember surprising Michael, Ethan and Jonah (before our other three came along) with rabbits one year at Easter. I determined that, for us, owning pet rabbits was a better thought than idea...but that's another story. Nonetheless, children and their pet rabbits have long time been a favorite subject of painters. Though I am more keen to having a painting of an animal than actually having an animal, I can't resist the charm and pure innocence in the paintings I'm sharing here. I adore each of these beautiful works of arts, and I hope you do as well.